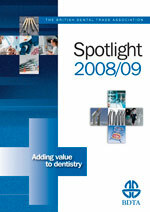 As an affiliate member of the British Dental Trade Association, StockdaleMartin recently received a copy of Spotlight, the annual BDTA publication offering a statistical breakdown of the UK dental industry. Loyalty to existing brands and suppliers most heavily influenced DHP decisions when investing in products and services. 59% regularly used social networking sites for both professional and personal reasons, with Facebook by far the most popular social networking destination. If you would like a more detailed summary of Spotlight’s findings why not get in touch on 0870 735 5385, or email laura@stockdalemartin.co.uk.